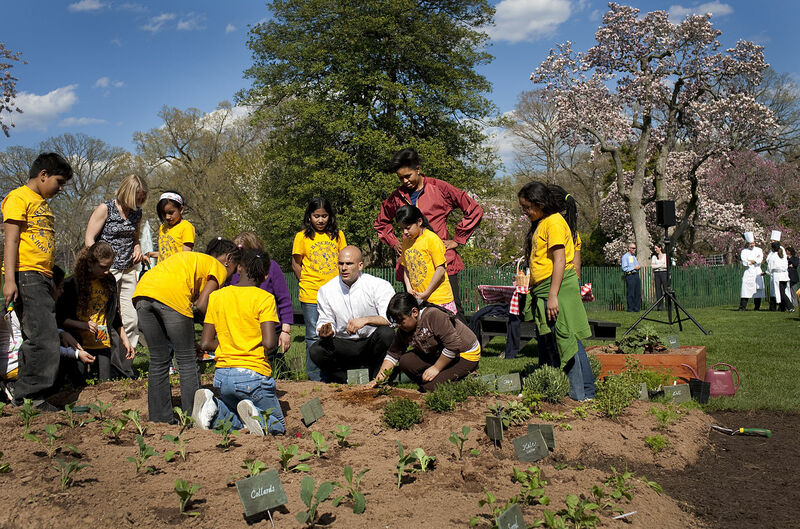 First Lady Michelle Obama and chef Sam Kass plant the garden with the help of Bancroft Elementary School fifth graders in 2009. Image source. Mere months after President Obama came into office, first lady Michelle Obama launched an organic garden project at the White House, complete with a composting system and beehives. … [W]e started thinking about the challenges that many families faced, so many other families were facing the same things that we were, trying to raise healthy kids. So I had this crazy idea that what if we planted a garden on the White House lawn to start a conversation about where our food comes from and how it impacts our children’s health. Well, fast-forward to spring of 2009 — Barack actually won … and that’s when we decided to move forward on this idea of planting a garden. Who Shut Down the White House Promotion of Local Organics? As Mrs. Obama mentions later on in her speech, many were opposed to the idea of an organic garden in the White House, and even more so to having a first lady focused on organic food and organic gardening as a source of health. Americans are quite used to politicians saying one thing and doing another, a form of ‘private vs public’ values. In the end, we shouldn’t be surprised. Talking points and policies are crafted by the industries, and politicians are tools hanging from the toolbelt of multinational corporate interests. Fresh foods grown conventionally are wholesome and flavorful yet more economical. Local and conventional farming is not mutually exclusive. If Americans were still required to farm to support their family’s basic food and fiber needs, would the U.S. have been leaders in the advancement of science, communication, education, medicine, transportation and the arts? It appears CropLife would have you believe growing organic food and living off the land makes you a fool. While farmers were once considered the backbone of our country, industrial agriculture is suggesting that eliminating most of the farmers has allowed leaders to emerge in other fields. We have no problem with this [organic] concept. But understand that you’re making lifestyle choices here about how you want your food produced. Fine. But don’t denigrate the other approaches to food production. It was also quite clear that the White House organic garden upset some significant donors, not because it was there, but because the first lady was implying that organic foods are healthier. What message does [a White House organic garden] send to the non-farming public about an important and integral part of growing safe and abundant crops to feed and clothe the world — crop protection products? I hope that you will take a moment to consider how important that message is to your livelihood, your passion for agriculture, and your growers’ future — and send your own letter, sharing the benefits of modern, conventional agriculture. Help allay any fears by providing a specific example of how what you do on a daily basis, including custom application and/or the sale of crop protection products and fertilizers, has saved a crop and/or improved yields to benefit more Americans. “Crop protection products” — that’s the industry’s term for what the rest of us call pesticides and toxic chemicals. According to the chemical industry, crops would suffer dramatic losses without these chemicals, and have positioned them as a farming necessity. Nothing could be further from the truth, of course, as you can grow healthy, thriving plants without any pesticides at all, provided you’re using appropriate support strategies. I’ve detailed many of these strategies in previous regenerative agriculture articles. In February 2010, Michelle Obama launched the “Let’s Move” campaign, which by then had turned into something quite different from her original stance, which had been focused on raising awareness about the impact of food on health and the importance of organics. Instead, the “Let’s Move” campaign focused on “solving the challenge of childhood obesity” — primarily by getting kids to exercise more. The aim of this group, which has since been disbanded,  was to minimize and obfuscate the scientific evidence showing that sugar (and sweet beverages in particular) are a majorcontributor to obesity and diseases associated with insulin resistance, such as diabetes. Arguing for more exercise is a good thing, but not when you’re placing the sole focus on exercise and making people think you can exercise your way out of a high-sugar diet. The fact is, your diet can make or break your exercise efforts. Not the other way around. Let’s Move” has deliberately veered away from pushing actual legislation, instead focusing on personal responsibility in nutrition and fitness. That’s a very different approach than the one Mrs. Obama took during the inception of her fight against childhood obesity. ‘This is a shared responsibility … And we need you not just to tweak around the edges, but to entirely rethink the products that you’re offering, the information that you provide about these products, and how you market those products to our children. That starts with … ramping up your efforts to reformulate your products … so that they have less fat, salt, and sugar, and more of the nutrients that our kids need. In a recent New York Times article,  Michael Pollan expertly details the subversive influence of Big Food on Obama’s presidency. Our broken food system contributes to many of our most pressing problems, including but not limited to health care costs, energy dependence, greenhouse gas emissions, antibiotic resistance and food safety. Yet the power of Big Food, in large part due to the centralization and monopolization that has occurred, effectively blocks any and all attempts at positive change. There can be no denying that our current food system is undermining public health and is a major contributor to environmental destruction and pollution, and while on the presidential campaign trail, Barrack Obama appeared very supportive of regenerative agriculture, and seemed in favor of agricultural reform. ‘In ways small and large, Obama left the distinct impression during the campaign that he grasped the food movement’s critique of the food system and shared its aspirations for reforming it,’ Pollan writes. Obama promised to label genetically modified organisms (GMOs), for example — a promise that was never fulfilled during his eight years in office. He also promised to address pollution from concentrated animal feeding operations (CAFOs) by bringing them under the authority of the federal Clean Air and Clean Water Acts — another campaign promise left unfulfilled, and there’s reason to suspect that industry pressure was at play in both instances. When Obama first took office, the new administration did launch an antitrust initiative, investigating potentially anticompetitive practices within several food sectors, including the poultry, dairy, cattle and seed industries. … [R]anchers and farmers testified to the abuses they suffered at the hands of the small number of companies to which they were forced to sell, often on unfavorable terms. In many regions … there were so few buyers for cattle that the big four meatpackers were able to dictate prices, impose unfair contracts and simply refuse to buy from ranchers who spoke out. Chicken farmers testified about how they had been reduced to sharecroppers by the industry’s contract system. Companies like Tyson and Perdue make farmers sign contracts under which the companies supply the chicks and feed and then decide how much to pay for the finished chickens based on secret formulas; farmers who object or who refuse any processor demands … no longer receive chicks, effectively putting them out of business. After months of investigation, the U.S. Department of Agriculture (USDA) proposed new regulations to level the playing field for producers. The proposed rules specifically addressed legal recourse, making it easier for producers to sue packers for unfair practices. Producers who complained or sued would also gain additional protection from retaliation under the new rules. The proposed legislation infuriated the meat industry, and after an intense lobbying campaign, the legislation was successfully squashed. Obama had launched the most serious government challenge to the power of Big Food since Teddy Roosevelt went after the Meat Trust a century ago, but in the face of opposition it simply evaporated. In order to follow the eight-year drama starring Big Food and both Obamas … it’s important to know what Big Food is. Simply put, it is the $1.5 trillion industry that grows, rears, slaughters, processes, imports, packages and retails most of the food Americans eat. Each of these sectors is dominated by a remarkably small number of gigantic firms. According to one traditional yardstick, an industry is deemed excessively concentrated when the top four companies in it control more than 40 percent of the market. In the case of food and agriculture, that percentage is exceeded in beef slaughter (82 percent of steers and heifers), chicken processing (53 percent), corn and soy processing (roughly 85 percent), pesticides (62 percent) and seeds (58 percent). Bayer’s planned acquisition of Monsanto promises to increase concentration in both the seed and agrochemical markets. Not only do all of these industry sectors have powerful lobbying organizations working on their behalf, they also have a large number of front groups secretly pushing the industry’s agenda under various other guises. And, while these industries are sometimes at loggerheads, they all have one common enemy: The local and organic food movement. One of the primary reasons why change is so difficult is because when these “four horsemen of agriculture” join forces, they form one formidable entity — one that Pollan refers to as “Big Food”. ‘The obesity epidemic ‘had put a bull’s-eye on the food industry’s back,’ Faber explained. Here was a chance to remove it, with the first lady’s help,’ Pollan writes. [M]aking junk food incrementally less junky is a dubious achievement at best. It tends to obscure the more important distinction between processed food of any kind and whole foods. What began as a cultural conversation about gardens and farmers markets and real food became a conversation about improved packaged foods, a shift in emphasis that surely served the interests of Big Food. While it can be argued that this was simply a concession to reality — because most Americans eat processed foods most of the time — to give up on real food so fast was to give up a lot. Big Food even derailed Mrs. Obama’s efforts to implement voluntary guidelines for marketing foods to children, and Faber was instrumental in this industry coup as well. The guidelines, which set standards for salt, sugar and fat in processed foods marketed to kids, were “a turning point” for the food industry. Faber told Pollan, because even though they were voluntary, they could potentially give certain popular kid foods a bad rap. The GMA decided to face the administration head on — and won without so much as a fight. Faber … told me he was ‘frankly surprised the administration never came back with a revised set of guidelines.’ Evidently the White House had lost its stomach for this particular fight. That wasn’t the only one, either. In the years after, Big Food scored a series of victories over even the most reasonable attempts to rein in its excesses. With clear evidence that processed junk food is responsible for childhood obesity and related health problems, Faber seems proud of his successful efforts to ensure that junk food manufacturers can continue to manipulate children with their cartoon marketing style. And as the health of Americans keep declining, he seems proud of his ability to influence politicians to ensure that toxic foods remain the status quo.